If you want to get yourself a good quality mask for snorkeling, you are going to want to make sure that it is going to be comfortable and leak proof. Without knowing anything about snorkel masks, it can be quite difficult to determine which masks in the marketplace meet these standards and which fail to do so. In order to make things easier for you, we have come up with a buyer’s guide as well as a list of our picks for the top snorkel masks. After going through the tips below, we think that it is going to make things a lot easier for you to be able to get both the quality and the comfort that you deserve. So, before you shop, take a moment to learn about features and other things that you’ll want to consider when getting a new beginner’s snorkel mask. This can be one thing that is hard to determine in terms of how comfortable the mask is, as well as whether the mask leaks or not. Trying the mask on is definitely one way to test to see whether the mask has a proper seal on it, but you can generally figure it out without actually having to order the product. It is generally something that the manufacturer will mention in their product’s description. You should look for something that has a double ridge of rubber on it, as this is much more likely to seal properly onto your face and keep the water out. Another thing that you can do, is look for clauses in the return policy or warranty policy that make the warranty or return invalid as a result of a leak in the product; seeing this means that the company isn’t confident in their product working properly over time and it likely is a product that you should be staying away from. 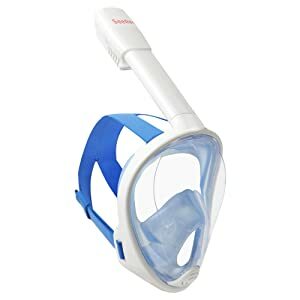 One thing that you should definitely think about if you are planning on buying yourself a snorkel mask, is just how deep of water you want to be able to use the mask in. If you want to be able to use the mask at a really deep depth, then it is likely that you are going to have to give yourself a higher budget in order to be able to buy a mask that is capable of keeping out water at that kind of a depth. 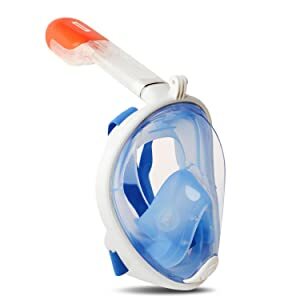 If you want to be able to find a snorkel mask to use in your swimming pool, you also aren’t going to have to worry as much about the type of lens that is incorporated into the design of the mask as you won’t have too much of a problem rising to the surface in order to remove the fog from the mask. Figuring out the purpose of the mask that you are buying is key if you want to be able to narrow down your options. One of, if not the most important things as far as comfort is concerned, is the ability for a snorkel mask to be able to adjust in order to sit on your face comfortably. Depending on how the snorkel mask is capable of adjustment, it can have a pretty big influence on how long it lasts you for. A mask with something like plastic clips and a plastic buckle may work for adjustment purposes, but all you have to do it give the mask one good yank in order to break it. It is always a good idea to look at a variety of models and look at how they adjust before making a purchasing decision. When it comes to lenses on a snorkel mask, there are a variety of things that you should consider. Depending how much you are willing to pay for a mask, you will notice a variety of different lenses with some pretty cool features are available on the market. 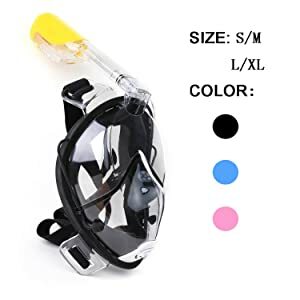 If you are just looking to get yourself a cheap snorkel mask, you will find that there are lots of masks available in the marketplace that have plastic lenses. This type of lens is prone to fogging and although you may find the odd lens that says they are anti-fog, it can be quite difficult to find one that won’t fog up on you. 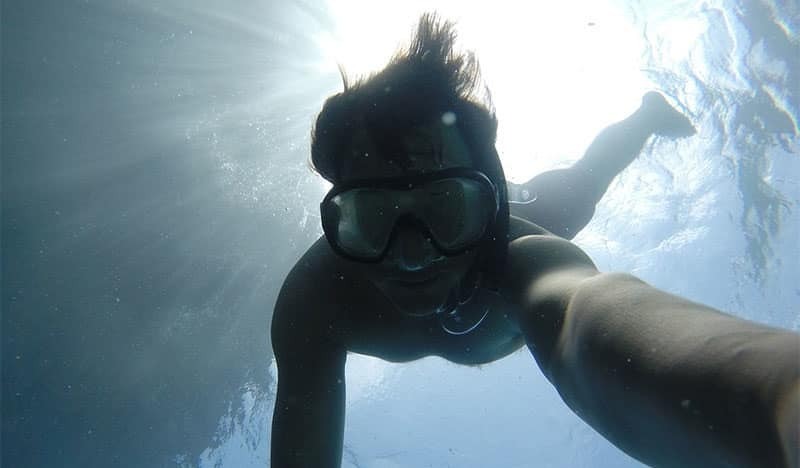 Glass lenses are another thing you are going to come across if you have a bit of a higher budget for a snorkel mask. Some glass lenses are designed to be anti-fog, but you will generally have to put some spray on them so that they don’t fog at all on you. The final thing that you may come across are prescription lenses. The best thing about this type of lens is that you won’t have to wear contacts or glasses when you are underwater. Unfortunately, getting yourself prescription lenses is probably going to be quite expensive, but it is a pretty cool option available to you. Especially if you are planning to get an expensive unit, then one of the things that you will need to make sure that you checkout is the warranty as well as the return policy of the unit. Different companies will have different policies and different clauses inside of their warranty and return policies and it is important to be aware of what you are up against, so that you don’t have to deal with any unexpected issues. Still not sure which of the masks is the best choice for your seaside adventure? Let our reviews below help you make that difficult decision. If you are looking to get a relatively high end snorkel mask, then this mask could definitely be of interest to you. This mask comes available in five different color options, so that it attracts a wide range of consumers and appeals to their personal tastes. This mask is a full face design and has a go pro mount on the unit that you can use to capture footage underwater if you desire. In fact, we think it’s the best full face snorkel mask on the market. This snorkel mask has some pretty advanced technology in its design that helps it to be a major market competitor. The snorkel is built so that salt water can’t get into your mouth causing you to be unable to breathe. Another advanced feature that you will surely like about this mask, is that there is a separate breathing compartment so that the mask can’t fog up on you when you are using it. This feature alone is a major selling point of this snorkel mask because fog is an issue that can be quite bothersome and can even prevent or slow down your snorkeling. If you are looking for a wide field of vision, don’t plan to dive down deep and you have a decent size budget, then this mask could definitely be the one for you. As long as you buy the correct size, you will find that this mask is great at keeping water out throughout the duration of your dive. This mask is easy to adjust and unlike most masks, you can breathe through your nose without having to worry about fog, which is a huge bonus. If you have an average size budget and you want a mask that comes available in a few different color options then this mask could be of interest to you. This mask is available in three different colors and comes in both a small/ medium as well as a large/ extra-large size. Although this mask may not have two different breathing and viewing chambers, this mask has an inhaling and an exhaling channel which helps to prevent fog inside of the mask from developing. This snorkel is designed to give you a wide field of view and it also has a mechanic that helps to stop salt water from entering your mouth, so that you don’t choke during your dive. This mask is designed to be light weight and comfortable on your face, which is not something that you will find too often on a mask that is available for this kind of a price. So long as you are willing to deal with the color options that are available for this mask, it is hard to beat the price for the amount of features that you get. This mask is designed to help minimize fog and the ear plugs are great if you want to try a deep dive every once and a while. You will definitely love how this mask fits on your face as it is very easy to adjust and is also light weight in design which makes it even more comfortable to use. If you have an average budget, then this may be the snorkeling mask for you. This mask comes in both a blue as well as a black color option which is quite plain, but definitely doesn’t look bad. The mask is available in two different size options including a small/ medium size as well as a large/ extra-large size option. This mask has a very wide field of vision and allows you to be able to breathe through both your nose as well as your mouth. The snorkel on the mask it quite long at 8.8 inches allowing you to breathe with ease. The mask is even designed so that you inhale and exhale through different channels which helps to minimize the amount of fog inside of the mask. Another thing that you will like about this mask, is that there is a draining system incorporated into its design. All you have to do is lift your head up in the air and any water in the mask will come right out. This mask is quite easy to adjust and is even fitted with a GoPro mount, so that you can film all of the things that you do underwater. If you are willing to deal with a bit of a risk of fog, in exchange for a cheaper price tag, then this could definitely be the unit for you. This unit is definitely a comfortable design, as long as you make sure that you buy the right size. 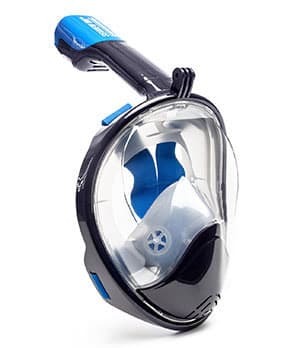 A very wide field of vision and the simplicity to choose between only two colors, all with a good quality overall product, helps to make this snorkel mask a major market competitor. If you have an average to high budget and want something that is a relatively new product, then this may be the snorkel mask for you. This mask is available in both a small as well as a large size so that you can make sure that you get an appropriate fit. The mask has a wide field of vision and offers the user the ability to be able to breathe from their nose or their mouth as they please. This unit is designed to help resist fogging as well, thanks to a polycarbonate lens used in the design. The mask is quite easy to adjust and actually has four points of adjustment so that you can get an accurate, leak free fit every time. If you want to make sure that you are getting something that was manufactured recently, then this product could be the one for you. 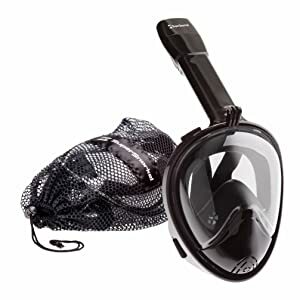 Although this mask may get a bit of fog when it is in use, you could always go and get an anti-fog spray for the lens if the fog gets too bad. The highlights of this unit are most definitely the fact that there are four different adjustment points built into the design and that there is a lifetime warranty on the unit to give you peace of mind with your purchase for years to come. This is another unit that is available for a pretty reasonable price tag. This popular unit has an extremely large field of vision, which allows you to be able to see the things that you want to see when you are under the water. The nice thing about this mask, is that it comes with two sets of ear plugs, a bag to carry your diving gear in, as well as spare seals. This unit is available in two color options and is also available in both a small/medium as well as a large/ extra-large size. If you are willing to deal with a little bit of fog in exchange for a quality, comfortable fit then this is probably the mask for you. The mask is available for a pretty reasonable price considering its features and it is also nice that it is available in two different sizes, so that it can fit a larger portion of people. This is one of the most highly rated masks in the marketplace for its price range and this is largely due to the mask’s clarity and the fact that it is a combo kit for this low of a price. Hopefully after reading this article you now feel as though you have a better idea as to what kind of options are available to you and some of the pros and cons of the different options. It is always a good idea to look at the warranty available on different units on the market in order to see what sorts of lengths they have on them. Additionally, you may also want to see how long the initial return policy lasts, so that you can have an idea as to how long you have to change your mind about a product. Best of luck in your search and hope that you get yourself an awesome snorkel mask for whatever kind of situation you are looking to use one for! As an ex Commercial Master Diver and also a free diver who came 7th in the world spearfishing contest. I would recommend buying the simplest form of snorkel, namely, an open ended tube and a mouthpiece and learn to clear it by blowing. any other type has the chance of failure and you get a mouthful of water. This can be very dangerous causing you to choke. A simple face mask that is also shaped to cover the nose allowing you to clear your ears. Another tip is to spit in your mask, smear it around then rinse before diving. It will never steam up.